Enjoy your stay at the Novotel Yogyakarta at a discount thanks to the 3-day Super Sale on 1 million hotel rooms at amazing rate across Asia Pacific that has been extended for 24 hrs until 30 Oct 09: read all about it at Accor Hotels 3-Day Super Sale Asia Pacific. The Novotel Hotel Yogyakarta is about 15 minutes from the airport and from Jalan Malioboro: the main shopping street in Yogyakarta. 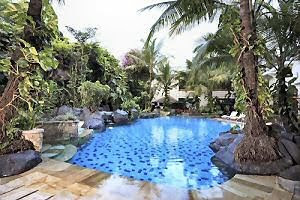 This makes the hotel ideal for business travelers, which means as a traveler you will be ensured to get service when you ask for it and classy accommodation, including transport-booking facilities to the many tourist sites in Yogyakarta as well as a enjoying the small yet cozy swimming pool and a good meal in the restaurant. A savvy traveler understands that when transport-booking facilities are available, you won't be able to get to tourist destinations or decent eateries by just strolling around. Yes, you read it right: you can get service when you ask for it. As in many hotels in Yogyakarta or hotels in Malaysia, there is no standard quality control imposed by the hotel management. Once for example you don't find complementary tea bags, you need to call reception, point out the problem and only then you will get what you would expect to get from a 4 star hotel. A hotel with quality control has a simple checklist to check whether or not tea bags are provided or not, it's not difficult to implement, yet it's more exception than rule. If you want to have a silent room in the Novotel Yogyakarta do ask for it in advance and do check out the noise once you arrive. If they put you next to the lobby or above the swimming pool, insist to get transferred to another room. As stated above; you will get what you ask in the Novotel Yogyakarta but make sure you do ask and state your needs!